“Dil Kiya Karey” is a new drama serial that aired its first episode on 14th of January at 8 PM on GEO Entertainment. It is a 7th Sky Entertainment production which we all know is a name that associates with high level productions. With the first episode itself, the drama manages to capture our attention completely. Which is why, here are 8 reasons we are definitely looking forward to watching the rest of it! The teasers were released a while before the first episode aired. And if are being honest, it left us with goosebumps craving for more. We got a glimpse of what is coming ahead and our expectations became sky-high. The OST of “Dil Kiya Karey” is everything you would want to see in a romantic, lovely and dreamy music video. The background music is close to the cultural roots and the lyrics will touch your heart. Feroze and Yumna look at each other with mad love flowing through their eyes! It is something that hints towards a drama with a love story plot between the two and leaves you wanting more. The teasers and the OST of Dil Kiya Karey had already raised our expectations so when the first episode aired, we started watching it with prejudiced hearts. Thankfully, the first episode was a huge hit. The plot set was intense, the dramatisation was fascinating and the acting was way better than expected! The lead roles of Dil Kiya Karey are played by Feroze Khan and Yumna Zaidi. They have a very accomplished working history with many serials because of their true-to-the-character performances and terribly good acting skills. A similar charm was seen in the first episode of this serial. Asma Nabeel is known for writing incredible scripts and story lines which grabs the attention of the audience as they can relate to them personally. One of the most fascinating features of Asma Nabeel’s writing is the incorporation of social messages in her story line. Even if her stories are about love and romance. Khaani was one such drama written by Asma Nabeel whose success reached the skies and was watched all over Pakistan. And it even garnered fame internationally! So, it can be assumed, Dil Kiya Karey is already set create new records. 6. An interesting “love story” with a hidden social message. The first episode has clearly hinted towards a drama that revolves around love. Plus, we also know that Asma Nabeel always includes social messages in her stories. This hint was confirmed by Asma Nabeel herself. 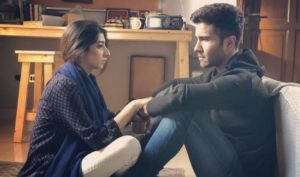 The story of Dil Kiya Karey is about a love triangle between Feroze, Yumna and Mariam Nafees revolving around polygamy in our society especially when a widow is concerned. So this story is definitely something that we are all looking forward to. 7. The drama is supported by some of our most veteran and favorite actors. 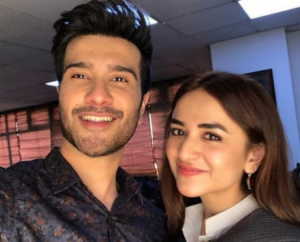 Along with Feroze Khan, Yumna Zaidi and Mariam Nafees, the cast also includes Sonia Rehman, Sarmad Khoosat, Shamim Hilaly, Abid Ali and Tanveer Jamal. If these cast members are not enough to excite us, then here is good news. Dil Kiya Karey will also star one of our most beloved, Marina Khan who has won our hearts ever since her dramas aired on PTV. Her come back after being away from the television screens for a long time is what makes Dil Kiya Karey even more exciting. 8. Great working team with amazing producer duo and a remarkable director. Dil Kiya Karey is directed by Mehreen Jabbar, a remarkable young woman who has stepped in the television direction industry with tremendous success. The cast is full of praises about her work saying she is exceptionally talented at what she does. We also have the amazing producer duo, Abdullah Kadwani and Asad Qureshi who are both known for a very long list of hit dramas including Khaani, Ghar Titli Ka Par, Romeo Weds Heer, Mera Khuda Jaane and many more. So this is without any doubt that Dil Kiya Karey has led up to a great expectation under their production.